How Long Should I Exercise on the Treadmill for Ab Results? Revealing your toned abdominal muscles underneath that layer of fat is certainly possible by exercising on the treadmill. However, if you do the same routine, at the same intensity and for the same duration, you are out of luck. The length of time you spend on the treadmill depends on how hard your training is. Even if you incorporate a fat-busting treadmill program most days of the week, you cannot eat more calories than you burn if you want abdominal results. You should consider paying close attention to what you eat and when you eat, optimizing your treadmill exercises for maximum visibility of the abdominal muscles you work hard to build. Reduce your daily caloric intake by 250 to 500 calories, to lose 1 to 2 lbs. per week. Keep your consumption of carbohydrates between 50 and 55 percent of your total daily calories instead of 60 to 65 percent, an amount close to what a competitive runner would normally eat. The creatine phosphate in your cells and the glucose in your blood are more readily available for your body to use as fuel at the onset of your treadmill workout; very little fat in your body is utilized in the beginning. It takes approximately 20 to 30 minutes for your cells to begin using fat as a major source of fuel for exercise. For a moderately intense, long-duration cardio workout for ab results, you should walk, run or do a combination of both for 60 to 90 minutes two days per week. 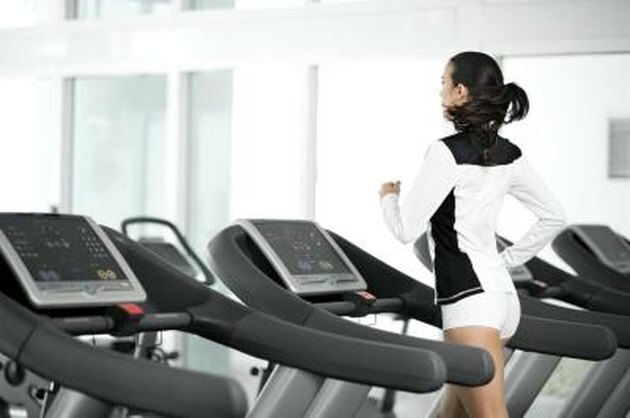 Vigorously intense aerobic workouts or high-intensity interval training on the treadmill burns a tremendous amount of calories even after your session is over. This type of workout stimulates a very high production of fat-burning enzymes and growth hormone, both of which will help in your quest to get ab results. You should use between a one-to-three ratio and a one-to-five ratio; this means if your work interval is 30 seconds your recovery interval must be 1-½ minutes, 2 minutes or 2-½ minutes. For instance, sprint as fast as you can for 20 seconds on a 1 percent incline then walk for one minute 40 seconds. Repeat this interval for a total of 20 minutes. You must run as fast as you can during your work intervals so be sure to increase the speed appropriately. Do this routine only one to two days per week, reducing risk of injury while increasing your body's capacity to incinerate fat, including around your abs. Highly intense cardio means you cannot talk, much less sing, during the session. Walk for 20 minutes after each session to cool down and burn even more calories. Not all of your treadmill workouts need to be super long or super hard. A medium-duration workout should be primarily at a moderate intensity with short bursts of higher-intensity periods. This type of training is commonly referred to as Fartlek training. Use the treadmill programs, selecting the hill or variety setting for 30 to 45 minutes. You should be able to talk, but not sing, at this intensity. Incorporate medium-duration cardio one day per week. Walk for 10 minutes to cool down. Exercise Physiology, Energy, Nutrition &amp; Human Performance; William McArdle, et al. Strength and Conditioning Journal; High-Intensity Interval Training: Applications for General Fitness Training; Brad Schoenfeld, et al. How Many Minutes for Abdominal Workouts Per Day?